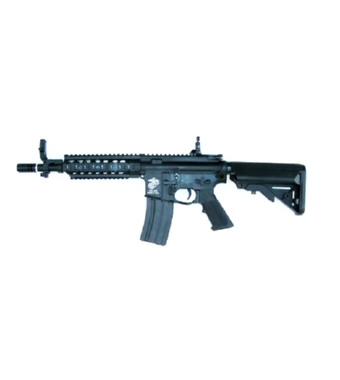 PRODOTTO DALLA JS TACTICAL, FUCILE ELETTRICO III GENERAZIONE MODELLO M4 RIS CQB MARINE EAGLE UP GRADE FULL METAL. BATTERIA IN DOTAZIONE CQB 9,6V 1400mAh, CARICA BATTERIA 220V 300mA. GUSCIO IN METALLO CON LOGO SERIGRAFATO (SU FRONTE E RETRO), CALCIO REGOLABILE IN ABS, CINGHIA CON REGOLAZIONE, TACCHE DI MIRA ABBATIBILI, 5 SLITTE PER IL FISSAGGIO DI ACCESSORI.